I have been face to face with more Wii shovelware than any other sane man on the planet. I have seen the Hellish depths of Chuck E. Cheese‘s inner sanctum, the frigid slopes of Line Rider 2, the glassy roads of Chevrolet Camaro Wild Ride. 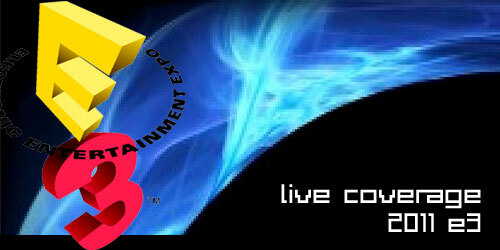 With my head held high, I have gripped my Wii Remote and plunged into the nightmares of Game Party 2. I strapped on my weight gloves and endeavored to defeat Deca Sports 2. I entered into the espionage and intrigue of Spyborgs. There was even a time in which I faced off with the most evil bald despot of them all: Howie Mandel. I know my Wii shovelware quite well. That is why Sniper Elite confused, confounded, frustrated, and disappointed me. When Sniper Elite arrived in my mailbox, I opened it immediately. 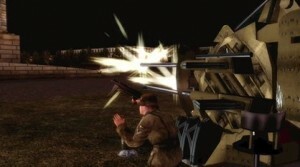 A World War II sniper game sounded like a perfect match for the Wii. 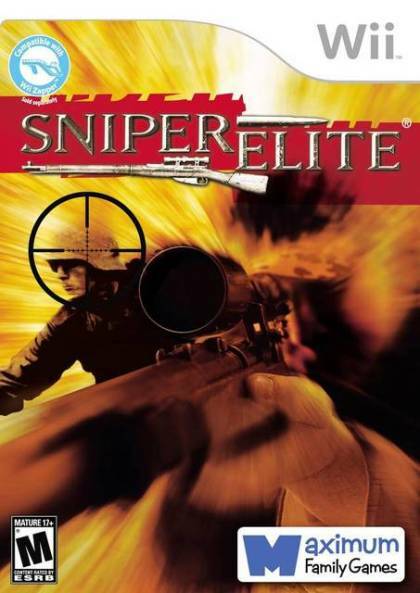 There have been other sniper games I enjoyed. 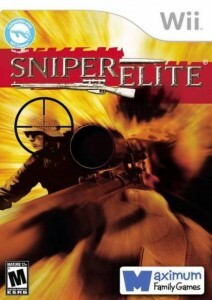 Well sniper game I enjoyed, that being Silent Scope for the Dreamcast. Gun games in general, though, are a genre that is alive and well on the Wii. House of the Dead, Ghost Squad, and Umbrella Chronicles all give my Wii pistol a workout. Even hunting games work on the Wii in a way they could not on other consoles. I was expecting good things. I cracked open the manual and continued to be optimistic. The instructions were clear, though dense, the paper quality high, and the information about the guns to be used in the game was a nice touch. I found myself intrigued with what Sniper Elite had to offer. Rare is the game in this era, no matter the budget, that has a decent manual. Little touches like this usually bode well for the quality of the product. When I started the disc, I was instantly smitten. 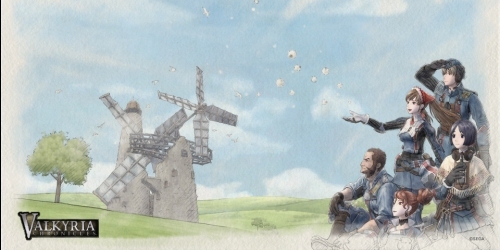 The game opens with dramatic war music, newsreel footage, and a dramatic voice over that sets the scene vividly. The main protagonist is an American soldier, fluent in German, sent into Germany to pose as a German soldier and wreak havoc upon our supposed allies, the Soviet Russians, in Apocalyptic Berlin. This plot is a world away from most WWII games that are usually too Hollywood. Sniper Elite feels adult and dark without feeling forced. The voice acting is superlative and adds a nice framework to the game. At this point I am confused. This is a Wii game, but it is appealing to my adult sensibilities. This is a game from a small developer and publisher, but it does not seem to be shovelware. The setting is WWII, but the plot is not generic. This is a port, but it feels like it was assembled with care and precision. So many contradictions, so little time. The single player game in Sniper Elite starts with a demo. 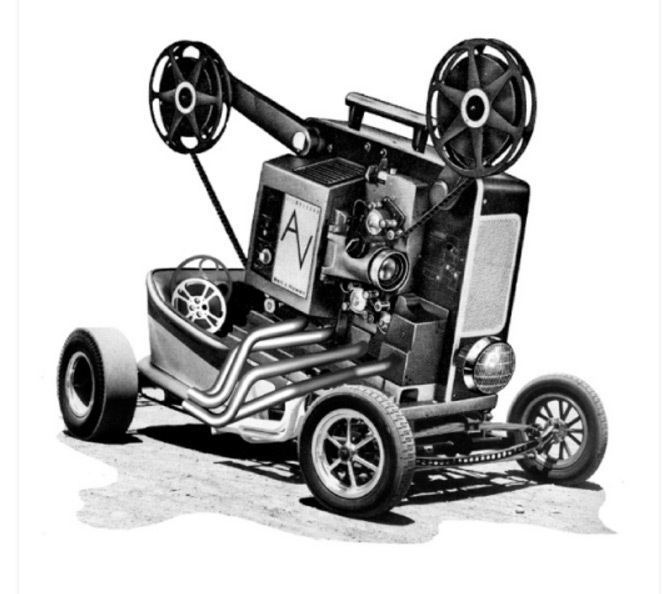 This demo races through the basics needed to survive the war torn streets of wartime Berlin. How to aim your sniper rifle, how to crouch, how to crawl – the usual suspects. Using a Wii Remote and Nunchuck in the Zapper, I started to feel a pain in the pit of my stomach. This being the preferred controller arrangement of the developers and all, I found it unpleasant. No matter how hard they try, no one can make a Wii Remote as precise and as comfortable as a keyboard and mouse. They will continue to try, but it is increasingly obvious that this control scheme works best for on rails type shooters and is not conducive to go anywhere shooters, be they first or second person. With or without the Zapper framework, the controls are unpleasant. Equally as disconcerting, the graphics are not good. Really not good. It pains me to say this, but they border on unacceptable. Yes, this is a war-stricken city lying in rubble. Yes, the soldiers are wearing camouflage. No, the entire game should not look like a brown drizzle. Everything is low on polygons and even lower on color. What is the point in playing a sniper game if you cannot see anything clearly enough to shoot it? 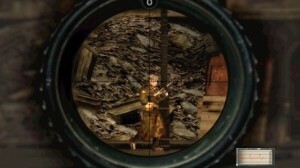 Was it not for little titles telling you that you are looking at a German or Russian soldier; it would be hard to tell. Scanning the muddy landscape for threats and targets is an eyesore and severely hampers enjoyment of the game. With the controller fighting me all along the way, the graphics forcing me to squint, and bullets flying my way, I endeavored to make the most of the Sniper Elite experience. The character you name ( I called mine Anton Von Schlook in honor of my brother, Baron Anton Von Schlook), makes his way through the carnage by crawling on his belly like one of those old wind up soldier toys they sold at the grocery store. Play mostly consists of crawling to some cover, scanning the horizon and rooftops for enemies, scanning for new cover, and crawling towards that cover. Rinse and repeat. The only thing that seems to change are the objectives. It is nice that the objectives usually have multiple paths between them, meaning that there is at least some multi-linearity to the game. No matter how much content there is in a game, it needs to be fun to access. Sniper Elite is not fun to play. The constant struggle to get the action onscreen to behave using the Wii Remote drains the player’s enthusiasm in a hurry. 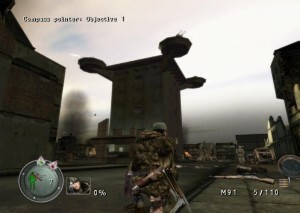 The graphics, with their N64 blockiness and muddiness reminiscent of games too generations ago, have painful gameplay repercussions. Even when my sniper went where I wanted him to, it was tough to get him to aim where I wanted. When he was pointed in the general vicinity of an enemy soldier, it was near impossible to see the target and tell him apart from the scenery. Ultimately, I wanted to enjoy Sniper Elite. I was ready to dig it. The trappings were so good, I expected quality shooting fun. What I got was a messy, blocky, muddy mess of a game, impossible to love. Will a small minority of gamers get a kick out of Sniper Elite? Yes, I believe so. In the end, though, this game is a failure. 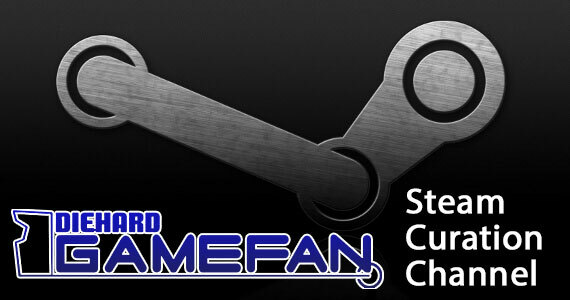 There are better, cheaper versions of this title, on systems with better control schemes. There are cheaper, better thrills on the Wii. Berlin as the Reich falls and the Germans roll in is about as evocative a setting as possible, a vicious bloodbath with repercussions still felt today. The Wii has single handedly saved the light gun genre from history’s junk pile. A late-WWII light gun game should be a slam dunk. Sniper Elite is not a slam dunk. Sniper Elite is a twenty foot jumper that clangs off the hoop. Were its aim more true, Sniper Elite would be a unique experience on the Wii. The whole thing sadly falls short. Sniper? Yes. Elite? Not so much.